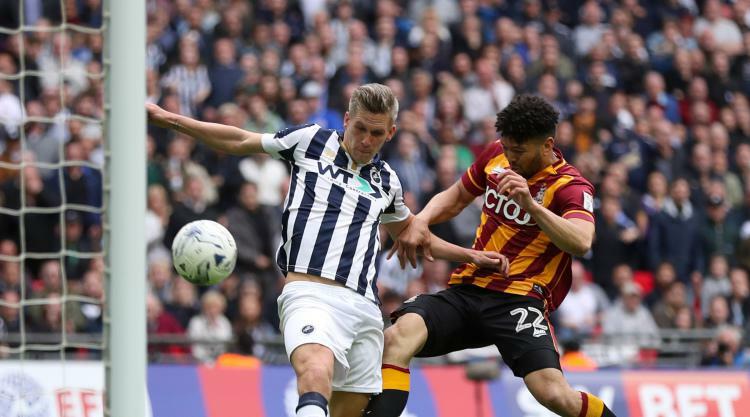 Steve Morison fired a late Wembley winner to clinch Millwall a 1-0 win against Bradford in the Sky Bet League One play-off final. Veteran striker Morison stole in at the far post as the tie appeared destined for extra-time to grab an 85th-minute winner and end the Londoners' two-year absence from the Championship. It was the evergreen Morison's 19th goal of the season and in a stroke expunged the memory of last season's play-off final defeat to Barnsley. Bradford, beaten by Millwall in the semi-finals last season, had looked the more likely to break the deadlock, but Neil Harris' side were rewarded for another never-say-die performance. Both sides made their intentions clear from the start. Bradford withstood a succession of early corners, while defender Tony McMahon fired wide and Millwall counterpart Shaun Hutchinson headed another set-piece from Shaun Williams over the crossbar. Bradford were denied a golden chance to take a 13th-minute lead when Millwall goalkeeper Jordan Archer displayed lightning reflexes to get his fingertips to a goalbound shot from Billy Clarke, who had raced clear on to Mark Marshall's defence-splitting pass. James Meredith then tested Archer with a well-struck drive from inside the penalty area and Hutchinson got his head in the way of McMahon's curling free-kick that appeared destined for the top corner. Bradford began to build momentum and threatened again when Rory McArdle headed McMahon's corner straight at Archer. But Millwall, making their fifth Wembley appearance in eight years, always carried a threat. City skipper Romain Vincelot was forced to make telling tackles to prevent both Morison and Hutchinson getting shots away in the box towards the end of the first half. Meredith's low shot following good work from Josh Cullen and Nicky Law was blocked at the start of the second period and at the other end Morison fired Lee Gregory's knockdown off target. Bradford applauded en masse in the 56th minute in tribute to those who lost their lives in the Valley Parade fire disaster and that was warmly reciprocated by Millwall supporters. Millwall then spurned their best chance of the match. Gregory's fine throughball set Jed Wallace free, but the winger dragged his low effort wide as an absorbing final hung in the balance. McArdle headed over again following McMahon's free-kick and as the clock ticked down towards extra time, the City centre-half's timely lunge denied Gregory from close-range after Morison's effort had been blocked. Bradford's football was still easier on the eye and Meredith headed McMahon's cross over following another slick move. But Millwall were still full of running and after a swift counter-attack with five minutes remaining, Williams' cross from the left was flicked on by the diving Gregory and Morison got in front of his marker at the far post to turn the ball home. McMahon lashed a shot into the side-netting in the closing moments as Bradford hurled themselves forward, but Millwall held on and it was all too much for some Lions' fans at the final whistle as they swarmed on to the pitch to celebrate.